And I just cannot see James and Sirius believing the traitor to be Remus unless there was ironclad proof that the spy had to be a Marauder - as in info that only a Marauder could supply - not just any other Order member. And that pretty much has to be about the Potters. <insert the part I forgot> Then Sirius knew about the switch and hence that Peter was the traitor. The only person that was left out was Remus, who believed that Sirius betrayed his friend as he wasn't aware of the switch. Edit: never mind this. I forgot that they were looking for a traitor before GH happened. My bad. Regarding Remus ability to be a traitor, IMO yes he was. He was smart, had a secret already and was good at hiding it, he would've been a good traitor. Last edited by Tenshi; March 26th, 2010 at 3:25 pm. Sirius would have died for his friends and expected the same from Peter. Was this unfair or was this an integral part of being a Marauder? It was part of being a Marauder, also it was part of being a friend. Depending on the circumstances we have, Peter should have died for them because him siding with Voldemort almost destroys the wizarding world. How did James' and Sirius' particularly close friendship influence Remus and Peter? Did they feel left out or inferior? I think it might have made them closer friends. I think Peter might have felt inferior since he wasnt that good at magic and he might have thought he's not worth of being friends with them. Remus on the other hand might have felt left out because of his werewolf decent. Why was Remus the main suspect in 1981? Did Peter have a walk-over to discredit Remus if he did so at all? I think every one was at fault here, they were.... Wizarding prejudice? For one they blamed Remus because he's a werewolf, even Dumbledore made this mistake of suspecting Remus. They blamed Sirius because he comes from the "Noble Black Family" also because of his brothers previous record as a deatheater. James, Sirius and Peter became Animagi for Remus. Was this noble or adventurous? It was a little of both, I can't even imagine the pain and loneliness Remus would have endured being all alone while transforming. Having the Marauders on his side after the transformation might have seemed a bit fun for them. What did the other Marauders think about James' obsession with Lily? I dunno about this one, Lily was supposed to be hot right? So i guess they would cheer him on. How did Lily influence the dynamics within the Marauders? Did she become the fifth Marauder, so to speak? James chose Sirius as godfather. Were Remus and Peter understanding or hurt by this decision? I think they were understanding because they noticed the level of their friendships over the years. Peter betrayed his friends. Was he ever happy with this decision and do you think that his friends would be able to forgive him if they had the chance? He was probably happy for a while until Voldemort's body got blasted apart and nothing but his shredded soul was left, then he realized he was done for but he couldn't go back to the others because they wouldn't forgive him at all for what he did. Was joining the Order a joint decision or was peer pressure involved? For instance, did James and Sirius lead the way and Remus and Peter follow? I think Remus would have joined either way, but for Peter it was AAAALLLLL peer pressure, keep this in mind Peter never does anything to benefit other people only himself. He might have thought they might accept him more or like him more if he joins, CLEARLY NOT. How do the Marauders compare to Fred and George? Do you think that they, and especially James and Sirius, were worse or just as (un)funny as the Weasley twins? I hate this question SOOO much. The Marauders jokes were cruel and almost sadistic, they seem to bully people more. The twins do their jokes for other peoples laughter. Did Deathly Hallows change your mind about the Marauders? Do you think that they were portrayed favourably or came out badly? Not that much the thing that really changed my mind about them was the Order of Phoenix because it portrayed how mean James was that made me so sad. Which Marauder do you like best and what are the traits that endear him to you? Did the other Marauders appreciate these traits? Siruis!!!! Padfoooooooot. I like him the best because after 15 something years in Azkaban he comes back a truthful friend, STILL, and he doesn't get mad at what happened he just learns from it. Yeah i think Remus has the same idea sort of, after losing his best friends he comes back after 15 years and is still loyal to them. Last edited by Nyjets4004; March 26th, 2010 at 3:36 pm. [*]What did the other Marauders think about James' obsession with Lily? Quote from Furry Dice: To be honest, I think this James-was-obsessed-with-Lily thing is a bit more fanon than canon. We see James ask her out once, I don't believe that means he continually asked her out or fawned over her. I think his pride was severely dented after Lily turned him down and he may have turned to dating other girls for a while to try to get over her, much as Ginny did to get over Harry. I don't see any boy with a shred of self-respect continually asking out a girl who keeps refusing him. In terms of knowing he fancied her, I'd imagine it would have been much the same as any boys knowing their friend has a crush - a bit of good-natured ribbing. Yes, it does happen a lot that guys who are rejected do continue to pursue a girl, and, I see James as intentionally persuing Lily after she turned him down. Not that he didn't have self-respect, but, I think her rejection of him hurt his pride and became a challenge, so, he set out to woo her. This doesn't deny the fact that they later fell deeply in love, but, James was used to having his way and I don't think he'd have taken kindly to being put down by Lily. Peter knew his weaknesses, and, when he was asked to be SK, he'd almost have had to know that Voldemort was going to go after all of the Potter's friends to try to find them. I wonder why, even if it was out of fear, Peter didn't turn down the off to be SK. Was it because he was already leaning toward joining Voldemort (it's been mentioned earlier that he might have suspected that Voldemort was winning and wanted to be part of the "winning team" for his own preservation. Does anyone think he was glad to be named SK because this gave him something valuable to offer Voldemort and, in that, make him self a bit more secure once Voldemort seized full power? What gets me thinking is the fact, that Peter is part of the Marauders. Why would James, Sirius, and Lupin accept him as one of theirs, i see lupin as the kid that gets picked on and i cant see James standing up for Peter. JKR never came right out and stated it as a fact (aside from Peter being a Gryffindor), but I'm assuming that Peter was their roommate. If that is the case, then they had no choice but to take him into their group in order to protect Remus's secret. I wonder why, even if it was out of fear, Peter didn't turn down the off to be SK. Was it because he was already leaning toward joining Voldemort (it's been mentioned earlier that he might have suspected that Voldemort was winning and wanted to be part of the "winning team" for his own preservation. I think Peter was already working for Voldemort long before Dumbledore suggested the Fidelius Charm. 'He suspected Black?' gasped Madam Rosmerta. Hmm.. I'm wondering if Peter actually wormed (excuse the pun ) his way into being made the Potter's SK. He could have subtly suggsted that Voldemort would most likely target Sirius and may even have thrown suspicion on Remus. I agree with you here, to some extent, insofar as you're claiming that James and Sirius's pranks were often mean-spirited and cruel. However, the Weasley twins are shown pulling pranks and taking revenge on people they dislike in ways that don't seem very amusing to me. I fail to understand how shoving a Slytherin rival into a malfunctioning, dangerous magical object which ended up doing him a lot more permanent damage than the Marauders ever inflicted on Snape is innocent and laughable. The twins were just as culpable as Sirius and James ever were, and I don't see much difference between them in either their mentality or their actions towards people they disliked. Last edited by LoonyForMoony; March 26th, 2010 at 10:23 pm. I wonder Peter was not confused, because he never double crossed Voldemort; he was hiding to stay away from the Marauders and the Order, for they believed him dead. He says he does not know what Sirius was talking about; it may mean both the fact he had not double crossed and the fact he was trying to think a way out of the currect situation he was in IMO. Yet that is what several of the DEs believe - as Sirius said to him in PoA it's because "Voldemort went to the Potters on your information and he met his downfall there". (paraphrased) I think that would be enough for Wormtail to fear retribution from those DEs who knew of his identity as the spy. Voldemort's downfall while acting on Peter's information would seem like he'd double-crossed the Dark Lord, even if he knew he hadn't. I think that's a good point - I agree that both groups acted very strongly against those they disliked, but the twins' misdeeds such as with Montague are overlooked much moreso than the Marauders' misdeeds, imo. I think it's largely because we see the twins in their good moments too. We don't see how the Marauders interact with the rest of their House. We don't really see them as teenagers in a non-conflict situation. I don't know, I think the repeated rejection would have been more of a dent to his pride than just one rejection and he may have cut his losses for a while. I really can't see him repeatedly asking Lily out. His "cool guy" image in Sirius' eyes would have suffered if he'd thrown so much energy at getting a date with a girl who kept rejecting him, and I think we are shown that Sirius' opinion seemed to matter a lot to teenage James. As far as I can recall, only one Fred and George joke - the one you mention - had any serious negative side effects. It's also highly unlikely that Fred and George had any intent of actually causing Montague harm. They were pranksters, not bullies. In the scenes we see of the Marauders, on the other hand, James and Sirius seem to delight in bullying and humiliating, and their actions arguably leave their victim with very severe and lasting damage. But that's a topic for a different thread. That said, it is to Sirius' credit that as an adult, he says he is "not proud" of those actions. Last edited by ccollinsmith; March 27th, 2010 at 3:16 am. But Sirius cannot STAY for Harry without having Peter to give to the Ministry. He would still be a wanted man and would still need to go into hiding. IF he wanted to have Harry come live with him, then he needed to prove his innocence (at the very least to Albus, so they could live in hiding at #12, but preferably to the Ministry, so they can live openly). Additionally, Sirius WANTED revenge. He was not after Peter just to protect Harry. As he put it that night in the Shack 'he wanted to commit the crime for which he was imprisoned'. He did not break out of Azkaban to get at Peter previously because he didn't have a clue where to find him - not until he saw the photo of the Weasley family in Egypt. True, but Sirius did find Peter and Harry stopped him from killing Peter. I doubt he would go after him and attempt to kill him again. IMO now that Harry knew the full story and did not blame Sirius for it would have made a big difference to Sirius. I think this could go either way. Peter may have tried to get out of the SK position knowing that he would have to give the information to Voldemort. James and Sirius would have thought that this was just his usual behavior and convinced him to take the post. Conversely, Peter may have quietly raised suspicions and rumors about Remus and tried to get the SK post. That's a very good point actually. . I think a part of why James and Sirius are sometimes seen as immature is that they're judged on their behaviour in their 15-years-old day. With the twins its different. We see them plotting, making pranks and joking even in serious situations. But we still see them in some really dangerous situations. For instance, the Seven Potters' chase, in which they both were very responsible and serious. I think Sirius and James were the same, when it came to the Order and Voldemort -they acted with responsibity despite their humorous nature.
. I don't think I totally get the instance you're talking about. Is it their hexing another student causing their head to swell? But since you said 'a topic for another place', I assume you're referring to their hexing Snape.. In which case, I don't think they left lasting damage. It may have been quite evil, though.
. I think this refers to the fact that Sirius and James had matured, despite what they had done in their teens. Sirius saw their actions in a new, adult light and could tell that they were wrong. But doesn't Sirius even TELL Peter that if he tries to escape they will kill him? Or is that movie leakage? It isn't as if Sirius is anywhere near Harry for that entire summer (and a good part of the fall - I don't remember exactly when he returns to live in the cave, but it is after Harry is chosen by the Goblet so after Halloween) so it isn't as if he couldn't have chased after Peter starting immediately - if it had not been full moon and he was needed to fight off Remus. I've forgotten our points on this (why we started this exchange), so it's probably just as well to agree to disagree. I just feel from his words that night that MOST of Sirius' wish to get at Peter was revenge for James, not safety for Harry nor forgiveness from Harry. But I will agree that it CAN be all three things. When Dumbledore asked Snape, "If you are prepared..." he didn't mean 'Have your Death Eeater robes returned from the cleaners'. Everything we've seen Snape do, was done knowing Voldemort WOULD return someday. And when that day would come, that he had better have the appropriate memories that would enable him to lie to Voldy's face. Last edited by hwyla; March 28th, 2010 at 8:36 pm. How do the Marauders compare to Fred and George? Do you think that they, and especially James and Sirius, were worse or just as (un)funny as the Weasley twins? I hate this question SOOO much. The Marauders jokes were cruel and almost sadistic, they seem to bully people more. The twins do their jokes for other peoples laughter. Also we only hear about the so-called "bullying and bad pranks" they did. If they were indeed that bad, why would McGonagall compare them with the Weasley twins. There must be pranks that were funny. People liked them, James and Sirius were one of the best in school. If they were soley bad guys then why do they be in McGonagalls memory as pranksters like the twins. Why would they ask them to join the Order if they were only trouble makers? But since you said 'a topic for another place', I assume you're referring to their hexing Snape.. In which case, I don't think they left lasting damage. It may have been quite evil, though. It depends on how one defines "damage." It is indeed a topic for another thread. Yes, I agree with you... at least wrt Sirius. I assume James grew out of it - or at least would have by the time he was 35 - but because we see so little of him, his maturity is all in the abstract. It's one of those things that has to be inferred, not something we are really shown. I think one of the key problems we have with the Marauders is that the only stuff we actually see is of them engaged in bullying. We are left to make inferences as to the rest. We know they made a cool map. We know that James and Sirius were popular. We know James was a Quidditch star. But those are really the only things we know about them. We are never shown why they were popular. The Marauders' assumed good qualities are pretty much in the abstract. But there are some very powerful scenes showing members of the Marauders, and those scenes do not present them in a positive light. It's really hard to undo the power of those scenes with abstract inferences about their positive qualities. I wish that - since JKR presumably wanted us to like the Marauders - she had given us more to like. Last edited by ccollinsmith; March 28th, 2010 at 10:44 pm. I think that is an integral part of any close friendship like the Marauders shared. When you care about someone so much that you are willing to put your life on the line for them it is natural to expect that they care about you that much as well. Sirius demonstrated that he was willing to put his life on the line to protect his friends by presenting himself as the secret keeper publicly. He knew that Voldemort would send Death Eaters after him and he was prepared to die - not just to protect James, Lily, and Harry but to protect Pettigrew as well. I don't think that was unfair at all. They believed Pettigrew was a far better man than he turned out to be. Lupin certainly didn't feel left out - he says himself that those were the best days of his life because he had friends. And they cared about him enough to take the time and effort to learn how to do a difficult piece of magic that could have gone terribly wrong just so they could keep him company during his transformations - which did help him and made him a lot less dangerous. Pettigrew is more difficult because I would say that he was never really a friend to the Marauders and never really cared about any of them. He used them from the start - aligning himself with them because he saw them as the strongest at the time. When he felt someone else was stronger he jumped ship. I don't think he felt left out because he never really joined in the first place. Sirius and Lupin never fully explained to Harry why Sirius thought Lupin was the spy. Lupin does tell Harry in DH that James would have considered it the height of betrayal not to trust his friends so we do know that it was only Sirius who suspected Lupin. In POA, Lupin's response to Sirius and immediate forgiveness shows that he understood why Sirius believed that - which shows that - whatever it was - Lupin felt it was a logical reason, IMO. I would say that it is very likely that Pettigrew did have some influence in that because it was to his advantage - particularly when the Potters decided to use the Fidelius Charm. Pettigrew was more clever than anyone gave him credit for - including his former teachers. I think he manipulated all of them to ensure that he was made secret keeper so he could tell Voldemort how to get to the Potters. I have to say it was noble because they had no idea what the outcome would be when they decided to do that. You cannot choose what type of animal you become - they could have all ended up being some weird type of insect that werewolves like to snack on. The animagus transformation is difficult and dangerous - they could have hurt themselves very badly in their attempts to learn how to do that. And the original plan was to keep Lupin company in the shack - which would have been very small and cramped for three large animals. They were willing to take such risks and endure hardship to help their friend through what he described as a very difficult, painful time for him each month. It did become adventurous for them once they had mastered the animagus transformation and realized that Lupin was much less dangerous when they were around them - his mind staying more human during his transformation. But it didn't start out that way. In the beginning, it was very risky and difficult and it took a lot of sacrifice and hard work. I don't see how anyone could not see that as noble. I wouldn't call James' crush on Lily an obsession. Doodling her name on a piece of parchment and wanting to show off whenever she was around are very normal things for a teenage boy to do when they like a girl. He wasn't stalking her and spying on her - that would have been obsessive - and rather creepy. I think his friends were rather amused by his crush and very likely teased him about it every chance they got. I'd say James was teased a lot that day after Lily told him off for being an "arrogant toerag". Not counting Pettigrew - whom I do not consider a Marauder - the Marauders had a very easygoing friendship between them and I think it was clear that they liked to tease and poke fun at each other. They remind me a lot of my dad and his friends. I would say she did become a Marauder in her own right. When you get married, you get the friends too - particularly when they are as close as the Marauders were. Plus they were in the middle of a war and that brought them all even closer together with all of them joining the Order and fighting together. Lily and James were forced to isolate themselves for over a year - even before they did the Fidelius Charm, they were staying at home and trying to keep a low profile because of the prophecy - so they really only had each other during that time. Anytime someone new comes into a group there is an influence on the group dynamics. James would have been spending less time with his friends and more time alone with Lily after they started dating. Lily would have spent time with the Marauders as a group as well. As we see in DH, Lily became friends with them and cared about them as much as James did - her letter to Sirius shows a very close friendship had developed between them, IMO. Sirius and Lupin cared a great deal about Lily - they were willing to die for her and Harry just as they would have for James. I would say they were more like family than friends - not unlike how Harry's friendship with Ron and Hermione developed. I doubt Pettigrew cared - he was already betraying them to Voldemort by then. I think Lupin would have understood. In any group of friends, there are degrees of closeness. James and Sirius met each other first and Sirius had essentially lived with James during the holidays after he left home when he was 16. That didn't change the fact that they cared about Lupin and were close to him as well. I think Lupin understood that and would have been happy for Sirius. I don't think Pettigrew was every really happy about anything - he was more concerned with staying alive than the quality of the life he led. Pettigrew was motivated by fear more than anything else. I don't think he felt any real remorse for what he had done - it comes across that he felt his betrayal was justified because Voldemort would have killed him. As such, I wouldn't expect any of them to forgive him. There are some things that cannot be forgiven. I would say that Pettigrew definitely followed simply because he had chosen them to be his protectors and was going to do whatever they did in that context. James, Sirius, and Lupin were all good people who understood that what Voldemort was doing was reprehensible and he needed to be stopped. I think they all would have joined the Order whether they were friends with each other or not simply because it was the right thing to do. That's just what kind of people they were. I think there are a lot of similarities between the Marauders and the Weasley twins. They were all very intelligent and creative. They all had a great sense of humor and were able to laugh at themselves - the world would be a much better place if more people were able to laugh at themselves, IMO. They were all very outgoing and, in some ways, larger than life - they lived life to the fullest and that's something to be admired, IMO. There are differences as well. The Marauders were better students than the Weasley twins because the twins put less effort into their studies and exams. The twins were more enterprising - finding a way to earn a living from the pranks they loved to play. Though I think the Marauders might have done something similar if it hadn't been for the war being in full swing when they finished school. The twins started their business when the second war was just starting out so it was a bit different for them. And they didn't have a big inheritance to support themselves like James and Sirius did. The twins were very outgoing like the Marauders, but also a bit more isolated to themselves - not uncommon with identical twins. They were friends with Lee Jordon, but a lot of the time it was just Fred and George hanging around with each other. The only change after reading DH was that I admire James even more - seeing him in the context of being Harry's father and how courageous he was to sacrifice himself in hopes that Lily could get Harry to safety - that was heart wrenching. On the whole, I think the Marauders were portrayed favorably - again, not counting Pettigrew as a Marauder. James, Sirius, and Lupin were all shown to be good, decent people who fought against Voldemort for the right reasons. They were courageous and willing to sacrifice themselves to save others - even those nameless, faceless people who would never know what they were doing. They were arrogant and rather careless as teenagers, but I think that is very normal - most teenagers are arrogant and rather careless to varying degrees. It's part of growing up - they learn from their mistakes. But growing up does not mean you have to become dull and boring or lose your sense of humor. I'm glad that the Marauders never lost their sense of humor or fun. That's a tough one because I really like all three of them. I guess I would have to say James because seeing him in the context of being a father to Harry added a new layer of depth to his character. I love his sense of humor and fun. I like the fact that he actually listened to Lily and made an effort to grow up and mature without losing himself. I admire the depth of his courage and loyalty to his family and friends. 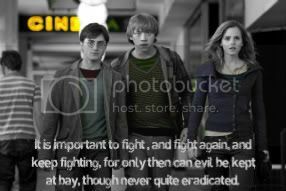 I admire him for fighting against Voldemort because it was the right thing to do. I admire him for being willing to sacrifice himself to save others. I loved seeing him play with his son and I was heartbroken that his son grew up without having a chance to really get to know his father. Sirius and Lupin are not far behind though. There are a lot of similar traits between the three of them - which is why I like them all. However, Sirius and Lupin had other issues that James did not so I have empathy for them as well. Sirius suffered because of his family and what he went through as an adult with James and Lily's deaths, his misplaced sense of guilt over what happened, and all those years he spent in Azkaban because Pettigrew framed him - he was damaged by those things. But that gives me more admiration for him as well because he still fought and wanted to stop Voldemort. Lupin suffered from the prejudice against werewolves as well as the loss of his friends - seeing him reunited with Sirius in POA was a beautiful thing. He had a lot to overcome and it was hard for him to see himself as being worthy of having friends or being loved. It was very sad that he died just as he was starting to overcome that and have some happiness in his life. I think they loved and appreciated each other because they had those traits in common. You pointed out a lot of good similarities and differences here. I think that the Marauders were more to themselves than the twins, though(jmo). The Marauders were in their own little world and occasionally they would come out of it so they could bully Snape or in James's case talk to Lily. We all know they even have their own group name for themselves. Both the Marauders and the twins did isolate themselves sometimes and both groups were also very open at the same time. I just think the Marauders were a little bit more to themselves than Fred and George. By the way I actually really liked your responses to all the qestions. I agree with everything you said and it's nice to see someone look at the Marauders in a positive way Nice job! I'm really surprised that Peter was able to avoid detection for over a year. I always saw Dumbledore as someone who more often than not performed Legilimency whenever he spoke to people. A habit if you like. Even assuming that Dumbledore doesn't use it always, Dumbledore knew that someone close to the Potters was leaking information. I can only assume that Dumbledore didn't believe Peter to be capable of it or maybe Voldemort performed some sort of charm that would help him avoid detection. That would be assuming that Dumbledore spent time with Pettigrew in which he could perform Legillimency - eye contact was required for that to work. As we see from OOTP forward, Dumbledore didn't spend a lot of time with the Order and didn't even come to all the meetings - which is logical because he had a school to run as well. Since Pettigrew had been spying for over a year, I would say he probably avoided any situation where Dumbledore could make eye contact with him. Pettigrew was one of those people that others don't pay a lot of attention to unless they intentionally draw attention to themselves. Peter cutting off his hand for Voldemort is an incredible thing. He had to do it himself. I can't even begin to imagine how dreadful it would have been. I think it says something for how effective the Cruciatus curse could be as a means of torture when cutting off your own hand is the preferred option. Voldemort was weakened in that ugly baby form, but he could still work the Unforgivables - and he had Nagini there as well. Regarding how Peter initially became a spy, IMO Peter had a huge advantage being a rat. He should have agreed to Vodemort and then just taken off. Voldemort wasn't about to go searching after Peter. Unless Voldemort did think of this and made plans to prevent Peter from fleeing. Voldemort controlled the Death Eaters through fear and punishment and only rewarded those he considered most loyal to him. If someone as lowly as Pettigrew was allowed to run away without repercussion, then others probably would as well. Voldemort needed Pettigrew to get information about the Potters - nobody else was close enough to them who would give him information. Sirius and Lupin would have died before betraying them - and I'd say that was true for the rest of the Order as well. That left Pettigrew as the only option. Had he refused or tried to run away, he would have been found and killed eventually. Pettigrew's only viable options would have been to either fake his death then and go into hiding as a rat - which would have been a lot more difficult at that point and I'd say the option of staying in rat form 24/7 was something he considered a last resort - or come clean to his friends and/or the Order in general from the start and tell them that Voldemort had come to him and threatened to kill him if he didn't spy on the Potters. Had he done that, he could have been hidden and protected by the Order - which would probably also have involved faking his death, but not having to live as a rat. But Pettigrew did not consider that a viable option himself - he had apparently already decided that Voldemort was going to win. One thing that bothered me was why Peter returned to Voldemort. Sirius was not about to hunt him again. He could have gone off somewhere and remained hidden. Instead he goes and finds Voldemort and helps bring him back to power. The possibility of Sirius and Lupin coming after him was only one thing Pettigrew had to worry about. There was also the possibility of them eventually convincing the Ministry that Sirius was innocent and revealing that he was alive. If they had been able to do that, then the Ministry would have been looking for him to put him in Azkaban as well. However, the biggest risk for Pettigrew was the Death Eaters because they knew that he was the real spy. Sirius heard the ones in Azkaban talking about Pettigrew specifically and some of them - like Karkaroff - had gotten released by giving information themselves. Others avoided being sent to Azkaban by claiming they had been forced or under the Imperius Curse - like Lucius Malfoy. Plus they were all connected by the Dark Mark - explained by Snape as a means to distinguish each other in GOF and shown as a means of communication that identified them to each other in DH. Pettigrew had the Dark Mark during the first war as well - Voldemort noted how Pettigrew's mark had "come back" in the graveyard in GOF. He was likely given the Dark Mark so he could make reports to Voldemort without the need for suspicious absences - he would only have to press his Dark Mark and the message would go out to all the Death Eaters and Voldemort so they would all get whatever information he was passing. Pettigrew was never hiding from the Order or the Ministry - they all thought he was a hero so there was no need for him to do that once Sirius had been sent to Azkaben. Pettigrew was hiding from the Death Eaters because they all thought he had somehow betrayed Voldemort and caused his downfall. Sirius escaping led to Lupin finding out the truth - as well as the trio - and that presented a risk for the Death Eaters eventually finding out he was alive as well. The only way Pettigrew could save himself from the Death Eaters was to find Voldemort and help him to prove that he had not betrayed Voldemort. Sirius did want revenge - and I can't really blame him after what Pettigrew did - but that was not his primary motivation. If it was a simple matter of revenge, I can't see Sirius waiting 12 years - he knew Pettigrew was alive and he knew what he looked like in his animagus form. He may not have known exactly where Pettigrew was hiding, but if it were simply about getting revenge against Pettigrew, he would have either broken out much sooner and started searching for him or revealed what he knew to the Death Eaters. It would have been even easier for him to get revenge simply by telling them that Pettigrew was alive and what his animagus form was - if they didn't already know he was a rat. The ones who managed to get released would have spread the word and Pettigrew would have been hunted down and killed. Likewise, he could have attempted to make some kind of statement when he was arrested. That would have been reported in the newspaper whether the Ministry believed him or not. The headline BLACK CLAIMS PETTIGREW FAKED HIS DEATH would certainly have gotten the attention of Death Eaters that were free. What motivated Sirius to escape and go after Pettigrew personally was the realization that Pettigrew was hiding as the pet rat of a student at Hogwarts because that put Harry in danger. The potential threat to Harry gave Sirius the push he needed to find a way to break out because he wanted to protect Harry. The years in Azkaban and his anger at Pettigrew for what he had done certainly effected his judgment and I would agree that Sirius made a lot of mistakes in how he handled that who situation - the decision that killing Pettigrew would be the best way to protect Harry led to his actions looking more suspicious by giving the appearance that he actually was after Harry. But I think the text makes it clear that the primary motivation was the desire to protect Harry. It wasn't until after Harry had talked Sirius and Lupin out of killing Pettigrew that Sirius realized turning Pettigrew in would prove his innocence and Harry might be able to live with him. Prior to that, he wasn't thinking about proving his own innocence - he was only thinking about killing Pettigrew so Harry would be safe. I'm not positive we can use this as proof that other DEs knew of Peter. Sirius certainly BELIEVED they were speaking of Peter, but they apparently never used his name. They only refer to the 'double-crosser'. Remember that a few of those prisoners had only been brought in during that last year of VW1. A time in which Albus had a spy among them. Consider also that we know for a fact that one of those same group of prisoners (Bella) was quite convinced that the traitor was someone other than Peter (see SpinnersEnd chapter of HBP). Even to the point of wanting to know where he was on the night Voldy 'fell' (the first time). And Bella was not alone in her suspicions. It is suggested that she take his response to her back to the others. It is quite likely that the 'double-crosser' they spoke of in their sleep was therefore him - not Peter. Just because Sirius THOUGHT they spoke of Peter does not mean they DID. He was unaware there was another person they might consider a 'double-crosser'. And IF he had something to do with their arrests, then it is quite likely they would mean him, not Peter - whom most of them most likely would not know about. Now ONE of the DEs probably knew about Peter. Whichever one was actually used to approach him. We have no idea whom that might be - or whether he/she was even still alive at the end of VW1. I have to disagree. The statements are too specific - particularly "they all think you're dead, or you’d have to answer to them.". There was only one "double crosser" that was believed to be dead - that was Pettigrew. Everyone else was either known to be alive or had died because they refused to betray Voldemort and chose to fight instead. Pettigrew was the only character they could have been referring to with that statement. Pettigrew was also the only "double crosser" who had told Voldemort where the Potters were - he was the secret keeper. Everyone knew that only the secret keeper could tell Voldemort where the Potters were so the Death Eaters could only have been referring to the person they believed was the secret keeper. Even if we were to ignore all of the other textual evidence and assume that some of the Death Eaters did not know about Pettigrew then the only other option would have been the man that everyone else believed had been the secret keeper - Sirius Black - who was in Azkaban and known to be alive. So that would not make sense either - why would the Death Eaters in Azkaban be ranting and raving about Sirius double crossing them and how they would kill him if he wasn't already dead when they could see Sirius was alive and in there with them? Again, that statement can only be referring to Pettigrew because it doesn't fit any other character. Sirius doesn't say Pettigrew's name because he's addressing Pettigrew - that would be redundant and it makes more sense for him to say "you" when talking directly to Pettigrew. Sirius was referred to as "the murderer", but that didn't stop them from using his name as well - the reference was "the murderer, Sirius Black". The Death Eaters referring to Pettigrew as the "double crosser" doesn't mean they didn't mention his name at all - more likely they said something like "the double crosser Pettigrew" or "the double crosser, Wormtail". What Sirius overheard was specific to Pettigrew and does not fit any other character. The Death Eaters knew that Pettigrew was the one who had told Voldemort where the Potters were - which means they knew that he was the secret keeper, believed he had double crossed them, and the only reason he wasn't being hunted by the Death Eaters who were free was the fact that they all thought he was already dead. And the only way they could have known that was if they had been involved in that or told about it before Voldemort disappeared - when they were all still free. Thanks for the correction Green Woods - altho' I think it might be a 'correction' in later editions then for JKRs 'bad math'. I distinctly remember gnawing on that info with several other people - wondering why Voldy had gone into hiding before Harry had even been born. That was a correction made in later printings. I have an older copy with the mistake and a newer copy with the correction. I believe it's on the list of corrections that the publishers released as a typographical error. However, IF Peter wasn't suspected because the Potters were 'safe' then we were given false clues in PoA. Minerva spoke of 'Sirius'/spy/reallyPeter as telling Voldy about the Potters 'movements' and Fudge said Albus counseled them to cast a Fidelius because it was too hard to hide from Voldy. That means there has to be at least one 'escape' for it suddenly to be more difficult than before. There was never any indication in the text that the Potters were attacked during that year - in fact, Dumbledore tells Harry that they were not when he compliments him for escaping Voldemort four times and tells him that not even his parents or the Longbottoms had managed that. The only escapes were the three times that the Potters had defied Voldemort before the prophecy was made. The term "movements" does not mean they were literally moving from one residence to another. Following someone's "movements" typically refers to their day to day activities - i.e. what time they got up/went to bed, daily routines, Harry's development, etc... Voldemort was gathering information to help him decide which boy was the bigger threat so much of the information about the Potter's movements that he was getting from Pettigrew would have been about Harry - and knowing what kind of schedule/routine they followed would help him plan his attack at a time that would be most likely to catch them by surprise - i.e. as Harry was being put the bed. Voldemort was biding his time - gathering information about both boys to help him decide which one would be the bigger threat. As we see in DH, the Potters never moved from their home - they were in Godric's Hollow that entire year and had formed a friendship with Bathilda Bagshot. They kept a low profile during that year because of the prophecy and didn't leave the house much - and weren't leaving the house at all by July - but they never moved. They were living in Godric's Hollow when Lily wrote that letter to Sirius to thank him for Harry's birthday present - nearly three months prior to the Fidelius Charm being cast at the end of October. It wasn't deemed necessary for them to officially go into hiding until after Snape had confessed to Dumbledore that he had told Voldemort everything he heard about the prophecy and that Voldemort had chosen Harry - which wasn't until October 1981 from what we're shown in the text. The trees being leafless would indicate mid to late October so it was probably a week or so before they cast the charm - which is consistent with Snape telling Umbridge that he had been teaching at Hogwarts for 14 years because that was in October as well. That was when Voldemort made his choice between Harry and Neville. Up to that point, they didn't know for certain that there would be any danger because they didn't know if Voldemort knew about the prophecy or not and there was no way to know which boy he would choose if/when he found out. The Longbottoms were probably doing the same thing as the Potters - laying low and waiting for more definitive information. Once the decision had been made for them to officially go into hiding, it was not necessary for them to move because the Fidelius Charm would prevent anyone who was not told the secret from being able to see their house or have access to it. There was never anything presented in the text to imply that the spy was "most certainly" a Marauder either. It was only said that Dumbledore felt that someone close to the Potters was passing information. That could have been one of the Marauders, but it also could have been others in the Order. In general, the Order was a very tight knit group - like a family. McGonagall also revealed in POA that it was not just the Potters - Dumbledore had suspected that someone on their side had been passing a lot of information to Voldemort "for quite some time" - meaning before he was tipped off that Voldemort had targeted the Potters. Dumbledore had more than one spy giving him information during the first war. I'd say it's more likely that Pettigrew wasn't suspected simply because he was careful not to do anything suspicious that would draw attention to himself. It wasn't necessary for him to disappear to meet with Voldemort so he wouldn't have to explain his whereabouts. Wherever he was, he could contact Voldemort and every other Death Eater who had the Dark Mark by pressing his own Dark Mark to send a message. And he could do that while sitting in the same room with James and Lily by simply putting a hand up his sleeve and pretending he was scratching an itch - they would have no idea of what he was doing. If they went to Diagon Alley to buy clothes for baby Harry and Pettigrew went with them, he could summon all the Death Eaters there within seconds and nobody would have suspected him simply because he was there with them when it happened. Nobody knew about the Dark Mark during the first war so that wouldn't have been suspicious. Even his nervousness was attributed to the circumstances of the war - like Lily assuming he was upset because the McKinnons had been killed. According to Lupin in DH, James never suspected him of being a traitor - he would have considered that a betrayal. Even in POA, that was attributed to Sirius only. Sirius and James were similar in a lot of ways, but they were not carbon copies of each other and they didn't always agree with each other. I can see where Sirius would be less trusting because he came from a very different background than James. He knew first hand what the Dark Arts were like because he had been raised by people who practiced the Dark Arts. He had personal experience with the type of people who became Death Eaters because he was related to people like Bellatrix Lestrange. Dumbledore likely started that ball rolling by telling James that he suspected someone close to him and Lily was giving Voldemort information. He did not suspect anyone specifically and that could have been anyone in the Order. However, Dumbledore being suspicious created a potential problem for Pettigrew - he couldn't risk being discovered and, once Dumbledore suggested the Fidelius Charm, it was imperative that he convince James and Lily to make him secret keeper because his life depended on Voldemort finding him useful. So it is most likely that it was Pettigrew who caused Sirius to suspect Lupin - possibly expanding on what Dumbledore told James - possibly just making what appeared to be idle speculation as to whether Lupin might have been put under the Imperius curse. His instinct would have been to make sure the attention was focused on someone else to prevent anyone from looking too closely at him. If Lupin was working undercover with the werewolves during the first war - which is possible because he would have done what was necessary whether he liked it or not, IMO - he would have been an easy target for Pettigrew to use because he would have been absent a lot. Lupin was also a good target for that because it ensured that Sirius would not tell him about the switch so there would be no witnesses to prevent him from framing Sirius when it was all said and done. Pettigrew could also use that as a means to influence Sirius towards the switch idea. Playing on the image he had projected to them for years - the nervous, bumbling friend - whispering his fears and worries to Sirius. If they got to Lupin, they'll come after you - James is sure to make you secret keeper. Lupin knows that. Everyone knows that. Pettigrew knew Sirius well enough to know how to manipulate him. He was a lot more clever than anyone gave him credit for. I agree. I think Jo does make a distinction with both the Marauders and the Weasley twins between "petty misdeeds" and serious wrong doing. And she did use the conversation the trio overheard between the teachers and Fudge in POA to draw a parallel between the Marauders - specifically James and Sirius - and the Weasley twins. That's enough for me to know that these characters were very similar in nature by intention. The Pensieve was a great idea, but I think it was already overused in the books - Harry couldn't continually dive into a pensieve every time there was some backstory to reveal. Some things had to be told rather than shown. She couldn't really show much of the Marauders themselves since all of that occurred long before Harry was born and James was dead so Harry couldn't see for himself what kind of person his father was as an adult. He had to rely on what other people told him. And everything Harry hears from people who actually knew the Marauders is positive - and I mean know as in actually had conversations and learned things about them as people. Their teachers liked them and enjoyed having them in class - they were completely shocked by the idea that Sirius had betrayed James and couldn't believe it was true. And they were right - Sirius didn't do it. Madme Rosemerta liked them. They were known to be troublemakers, but nothing they did caused the adults around them to be suspicious of them or think they were rotten to the core. Everyone who really knew them, liked them from what Harry hears. My take is that Jo drew a parallel between the Marauders and the Weasley twins provide a model for comparison. They enjoy pranks and jokes, but they aren't out to hurt anyone. People know the twins are likely to pull a prank on them and are very cautious - particularly in GOF when they start working on developing their own products - but they like them anyway because it's funny. But they will also stand up for themselves and people they care about and retaliate when they feel justified in doing so - i.e. at the end of GOF when they join the trio in hexing Draco, Crabbe, and Goyle because of what they were saying about Voldemort and Cedric's death, threatening Zacharias Smith when he was antagonizing Harry in OOTP, or putting Montague in the Vanishing Cabinet because the Inquisitorial Squad was abusing the power Umbridge gave them to take points away for things that were not against school rules. Those things were not good behavior and sometimes there were dire consequences - putting Montague in the Vanishing Cabinet in particular because that led to Draco figuring out how to get Death Eaters into Hogwarts. But I think the overall portrayal is positive - they're good people who made mistakes and learned from them. That's how I see the Marauders being presented as well. They aren't exactly the same, but there are enough similarities to make the Weasley twins a good model for comparison. I agree. I think James would probably have played it cool - occasionally asking her out and playing it off as no big deal when she refused. From what Sirius and Lupin said, James mostly focused on drawing her attention by showing off whenever she was around. He also turned to Harry and asked him if he agreed to that - and Harry did. If Harry had asked him to find another way to deal with the possibility of Pettigrew transforming and escaping, he would have, IMO. Sirius put away his desire to kill Pettigrew simply because Harry asked him to. He didn't have to do that. Neither did Lupin for that matter. They chose to do that for Harry. I think the point you make about Sirius fighting Lupin off actually shows that Harry's safety was the primary concern for Sirius. He could have chased after Pettigrew when he transformed in POA and he might have even been able to catch him - hard to say because rats are fast little buggers - but he made a conscious choice not to and focused on driving Lupin away after he transformed. Sirius put Harry, Ron, and Hermione's safety above everything else - getting revenge, proving his innocence, his own safety - the kids safety came first for him. And that resulted in the dementors catching him and almost giving him the kiss on the grounds as well as him being captured and taken to the castle as a prisoner - where they sent for the dementors to give him the kiss. He risked everything to save Harry, Ron, and Hermione. Sirius couldn't stay because he was still wanted by the Ministry, but that didn't stop him from building a relationship with Harry. He stayed in touch and they corresponded that entire summer - as well as the following summer. And he put himself at risk again by coming back the minute he felt that Harry was in danger. He lived in a cave and kept himself alive by eating rats just so he could be close by if Harry needed him. And he disregarded his own safety to join the Order at the Ministry to rescue Harry and his friends in OOTP. The text leaves me with no doubt that Harry came first for Sirius. HBP “Spoken both like your mother and father’s son and Sirius’s true godson!” said Dumbledore, with an approving pat on Harry’s back. “I take my hat off to you — or I would, if I were not afraid of showering you in spiders. If nothing else, that quote alone would tell me that James and Sirius were people to be admired and respected. But it's not just Dumbledore. Everything Harry hears from people who actually knew them shows that they were liked and admired - both among their peers as well as by their teachers and Dumbledore. McGonagall in particular would not have been amused by their antics if they were really bad, IMO. She had a soft heart, but she was still very strict. I think Rosemerta voiced the general opinion of everyone who had actually known James and Sirius - Sirius was the last person that any of them thought would go over to the Dark Side. For people to still be saying they couldn't believe it even with all the evidence against Sirius 12 years later says a lot about what kind of people James and Sirius were, IMO. I never really got that impression about the Marauders. Not to the same extent as Fred and George anyway. They struck me as individuals more than the twins. They had their group nickname and they had a reason to keep things to the four of them at certain times - specifically Lupin being a werewolf with his monthly transformations - but they were also individuals with their own unique personalities, ideas, and opinions - and they didn't always agree with each other. Fred and George were more like one person and were so in sync they spoke in unison or finished each others sentences regularly - also not uncommon with identical twins. That's a large part of the tragedy of Fred's death - George lost half of himself when Fred died. They also weren't with each other 24/7 like we see with Fred and George. Sirius was alone when he pulled the werewolf prank - both in thinking it was a good idea as well as actually doing it. James went down there by himself to stop it. When Harry had to copy the punishment cards in detention he notes the regular jolt in his stomach when he sees Sirius or his father's name - usually coupled together, but the "or" shows that there were also occasions when it was just one of them. Lupin and Pettigrew's names only showed up occasionally so they weren't always part of whatever petty misdeeds James and/or Sirius had done. And I seriously doubt James was taking his friends along when he went on dates with Lily. I do agree that the Marauders spent a lot of their time as a group, hanging out with each other - at least when they were students anyway - but it stands out to me that they were individuals as well. I think Pettigrew was probably the only exception - it seems likely he was always hanging around one of them because he had chosen them as protectors rather than as friends. We don't really get that sense of individuality with Fred and George - they were always a unit and it was more like they were two halves of a single person than individuals because they were identical twins with nearly identical personalities, ideas, and opinions. As I said, that is not uncommon for identical twins and I don't think that's a bad thing because they were identical twins, but I think that is a difference between them and the Marauders. Okay, now, TOPIC. Let's stay on it, because we are having paragraphs and paragraphs of off-topic-ness here. Interesting it may be, but it doesn't belong in this thread. Want to discuss Peter? Go ahead, he has a thread. This is for discussion of the Marauders as a group. Let's keep separate things separate. Last edited by mexicant; March 30th, 2010 at 12:20 am. I think that this was a consequence of having grown up knowing war and it effects firsthand. I don't think that they had made any explicit death pacts or vows of loyalty. It's likely that James was the first kid his age that Sirius really hit it off with. James must have been such a refreshing changing from the usual 'Toujours Pur' crowd that he lived with. Their easy camaraderie is evident from the small glimpse of their initial meeting we see in DH. I think that Sirius's fierce loyalty to James was because James accepted him without question even after knowing that his entire family had been in Slytherin. I think that Remus was too glad to be accepted into their fold to be upset about James and Sirius's closeness. Considering the magical society's attitude towards werewolves, it must have been such a relief for him to be treated as a brother by them. I think that Peter did feel outclassed by his powerful friends, but I can't blame James for being closer friends with Sirius than the other two. James and Sirius knew that Peter was weaker than them, but none of their interactions we see warrant a betrayal. Sirius in particular was rather harsh with him. I can't believe that Peter was swayed merely by threats. I think that Voldemort offered him something that his friends couldn't - power of his own. Overall, I think that Remus and Peter acknowledged that James was closer to Sirius than either of them ever would be. I don't think that either of them resented it. James and Sirius were a team on their own, like Fred and George were. I think that Peter played a significant part in it, though he did it to throw suspicion off himself, rather than to discredit Remus. Someone close to the Potters was a traitor, and IMO, he planted doubts in Sirius's mind to clear himself. He knew that Sirius didn't think much of him, and wouldn't consider him capable of pulling off something like that. It's also likely that Voldemort arranged things so as to help fuel it. It does seem that they did pick the most adventurous solution to their problem. But the wolfsbane potion hadn't been invented yet, so it's likely that this was the only other way. But then, James and Sirius were skilled enough to pull it off, and it was admirable of them to assist Peter as well. It was also noble of them, because they risked a lot by doing something so illegal and dangerous, investing years of study and research, all for their friend. I don't think that James was obsessed with Lily. He fancied her, true. And asked her out in fifth year. They started going out in 7th year, and were married soon after leaving school. That's all we know for sure. From the familiarity in the letter Harry finds at GP, I'd say that she was very close to them. We know that she already liked James, and that Sirius tried to be friendly towards her after the sorting. She reacts coldly when Snape insinuates that Lupin is a werewolf, which could be because they're friends. She is also affectionate towards Peter in the letter. I don't think that Lily affected the dynamics. Besides, James and Sirius had calmed down by the 7th year. I think they would have been understanding. James had to pick one of them, and Sirius was closer than a brother to him. I don't think that he was ever happy with his decisions. It never brought him anything but humiliation and loneliness, and he lived in fear throughout the rest of his life. Even after Voldemort had taken over, he was still kicked around by pretty much everyone. And that, IMO, made him hold on to that regret. IMO, it's rather ironic, because Harry only escaped because Voldemort had mistreated and underrated Peter. I don't think that James and Sirius even had to think about it twice. I wouldn't call it peer pressure, In Remus's case, I think it was loyalty more than anything else. Loyalty to Dumbledore and to his friends. As for Peter, I think that he decided to stick with his friends for protection, until Voldemort started taking over and his resolve crumbled. IMO, James and Sirius were much more powerful and skilled than the twins. But their talents lay in different areas. They were after different things. For Fred and George, pranking and jokes were their lifestyle, but it seems to me that James and Sirius were more about adventure than pranks. DH didn't change my opinion of them at all. If anything, it confirmed my suspicions that they were handing out some well deserved vigilante justice to Snape and his DE compadres. I think that they are portrayed very favourably. I like James best. I appreciate his bravery, courage, and loyalty to friends and family. I think that the other marauders appreciated them as well. I always thought most of the students roomed together, thats interesting i really never thought they would have roommates. And if they could have roommates would they have to pick them or were they assigned because that brings up the question of why would James and Sirius pick Peter. I'm assuming that the same was true in his dad's day -- only four Gryff boys in James's year and they're rooming together.